Because so much of the holidays centers around food, when I first went vegetarian, this was an uncomfortable time for me. After all, the whole meal during Thanksgiving centers around a turkey and traditionally, for our family at Christmas, a pork roast or ham. How do I be a grateful guest and subtlety turn down turkey or ham? What was I supposed to prepare if hosting? Would people be interested in shifting traditions to a vegetarian (or vegan) feast? Back in the day, the Internet was just emerging, so turning to it for help or suggestions was out. There were few vegetarian cookbooks and I only knew one other vegetarian, my sister. So, I started experimenting, thumbing through magazines for ideas and turning old meat based favorites into new vegetarian favorites. 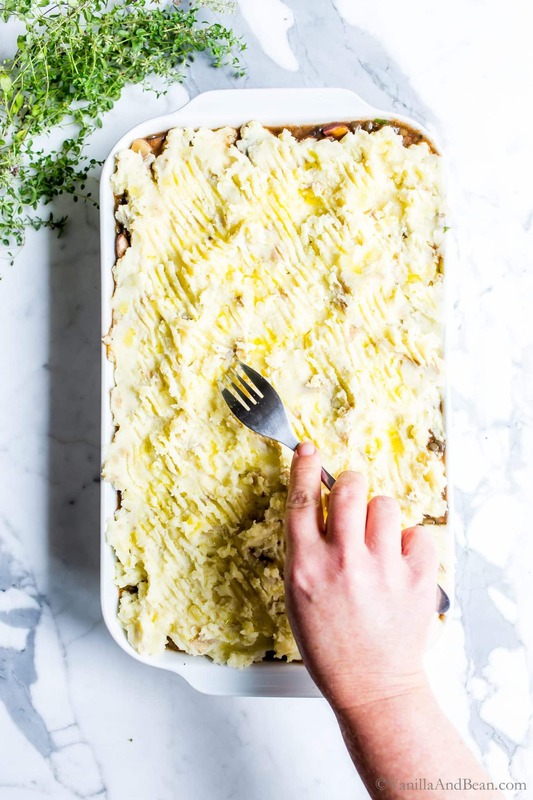 This Cottage Pie is one of those old favorites and adapted heavily from my mom’s original, meaty and crave-worthy Shephard’s Pie. Cottage pie, synonymous with shepherd’s pie, has many variations but in traditional form it’s a meat pie with a mashed potato crust. 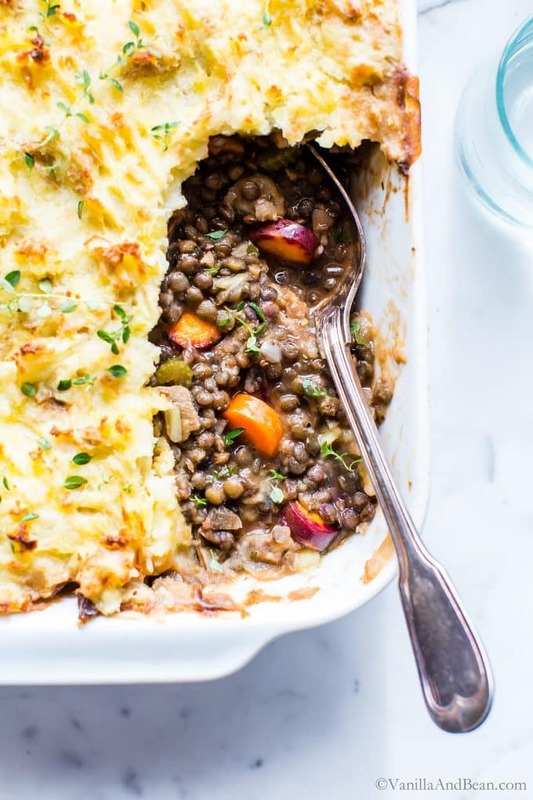 In this cottage pie, French lentils and mushrooms replace the traditional meat ingredients however, the sought after umami is still apparent. This recipe calls for a mix of mushrooms. I always include fresh, but also easy to rehydrate dried porcini (por-che-knee) and sometimes oyster mushrooms if I can find them. Any dried mushroom will do. They have a hearty texture with an earthy flavor that pairs well with French lentils. The best part about the rehydration process is the divine broth that is created from soaking the porcini; I use this broth, in part, to create the gravy. First, start by cooking the potatoes in a big pot of water. 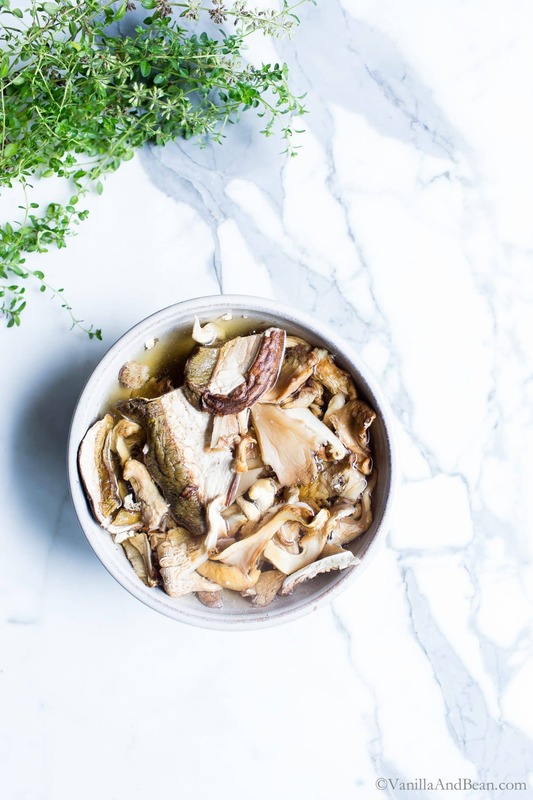 Rehydrate the dried mushrooms by pouring boiling water over them and letting them set until tender. Put the lentils on to cook. 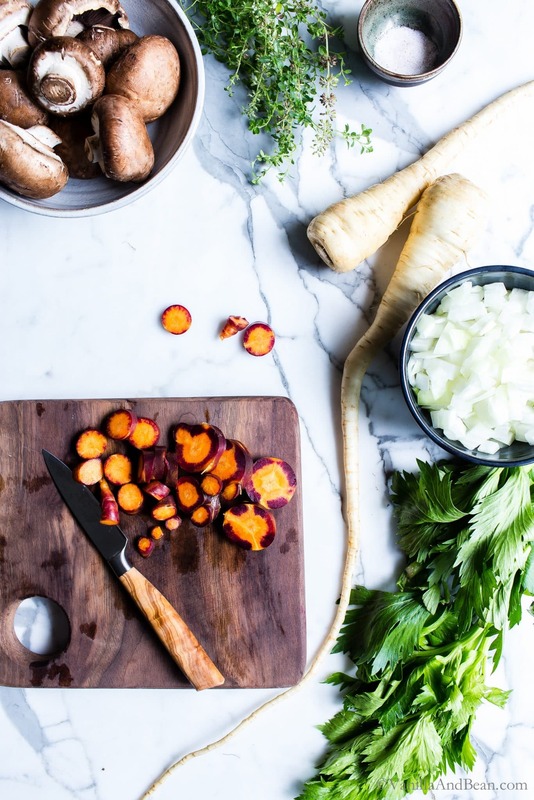 Next, prepare the veggies by chopping them into bite size pieces: onion, celery, carrots, parsnips and fresh and rehydrated mushrooms. Continuing, saute the veggies and add in the flavor builders like sherry (or a glug of red wine), tomato paste, and herbs. Stir in the reserved mushroom broth, flour or corn starch (if gluten free) and the cooked lentils. Mash the potatoes, assemble the pie and bake! This Cottage Pie recipe is labor intensive. There’s a lot of chopping, tasking and multiple pans to deal with. That said, this can be made in a Dutch oven which will reduce the overall pans necessary to cook and clean for this recipe. Make the recipe vegan by omitting the butter in the potatoes and using either olive oil or a vegan butter alternative. Make the recipe gluten free by omitting the flour and using cornstarch instead. Make ahead? Yes please! Bake, then cool. Cover the Cottage Pie in foil or lid the Dutch oven and refrigerate for up to two days. Reheat uncovered in a 350F oven for about 20-25 minutes. Freezer friendly? Yes please! Store in individual containers and freeze for up to two weeks. 1/2 C (30g) Celery small dice, about 2 stalks. Reserve the leaves and chop if available. Place 1 tsp of salt, garlic cloves and potatoes in a large saucepan. Cover with water, bring to a boil and simmer until potatoes are fork tender; about 20-25 minutes. Drain and allow to set uncovered to steam off excess water for about 10 minutes. Add the apple cider vinegar to the milk and whisk. Let stand for 5 minutes. (this is a shortcut to buttermilk). To the pot of potatoes and garlic, stir in remaining 1 tsp of salt, nutmeg, pepper, butter and milk mixture. 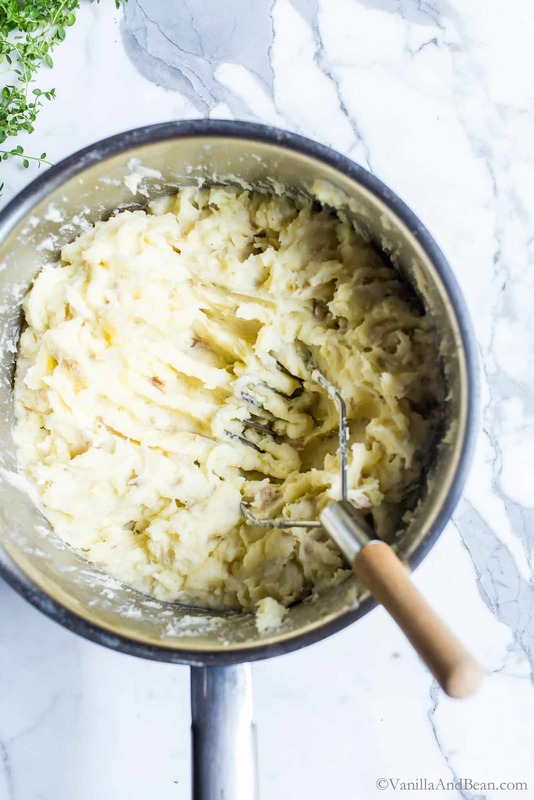 Mash until potatoes are smooth and creamy. Adjust seasoning as needed. Set aside. Meanwhile, In a medium sauce pan, add lentils, 2 C (460g) water, bayleaf and 1/2 tsp sea salt. Bring lentils to a simmer and cook on medium heat continuing to simmer, uncovered for about 30 minutes. They should be tender when done. Set aside. While the lentils are cooking, boil the remaining 2 1/2 C (690g) water in a tea kettle. Place dried porcini in a bowl and pour the 2 1/2 C (690g) of very hot water over the porcini. Cover and rehydrate for about 30 minutes. Through a fine mesh strainer lined with cheese cloth or coffee filter, drain the porcini pushing/squeezing the porcini and excess broth through the strainer, reserving the broth into a large 2-4 C measuring cup. Set the broth aside, remove the cheese cloth, and put the porcini in the strainer. Rinse the porcini under cold running water over the sink. Squeeze out excess water through the strainer and into the sink. Rough chop the porcini mushrooms. Set aside. Preheat oven to 375F (190C). If the mushroom broth does not reach the 2 1/2 C mark, add enough water to yield 2 1/2 C broth total. Pour 1/2 a cup of the broth into a separate container and add the flour (or cornstarch). Whisk throughly. Set aside. In a large saute' pan or Dutch oven, add the coconut oil. Heat to shimmering. Turn heat to medium and add the onion, parsnip, celery, carrot, all mushrooms, and remaining 1/2 tsp sea salt. Saute' for about 7 minutes, stirring occasionally. The veggies should be tender. 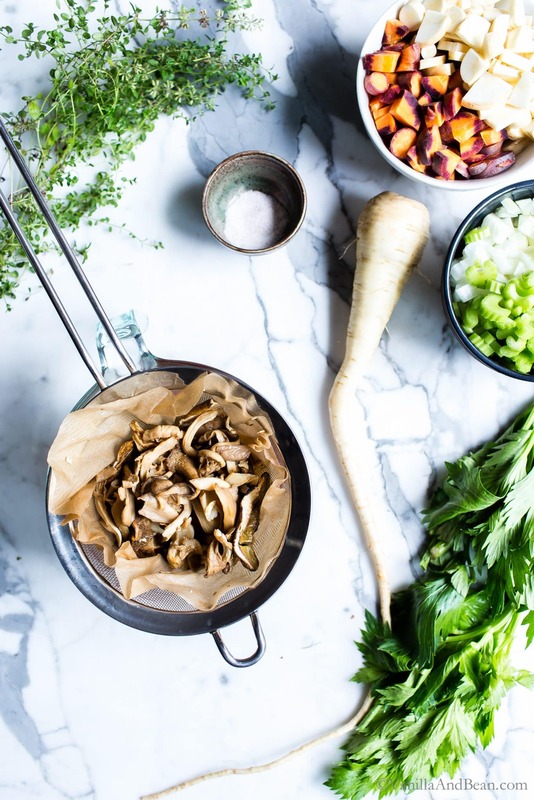 To the saute' pan or Dutch oven with the veggies, add the sherry, tamari, tomato paste, fresh thyme, reserved celery leaves (optional), ground pepper, 2 C of mushroom broth and lentils. Heat through on medium heat just to a simmer. Add the flour/broth (or cornstarch) mixture and simmer, whisking gently, until mixture thickens, for about 2-3 minutes. Taste the lentil mixture for seasoning. Adjust to taste. 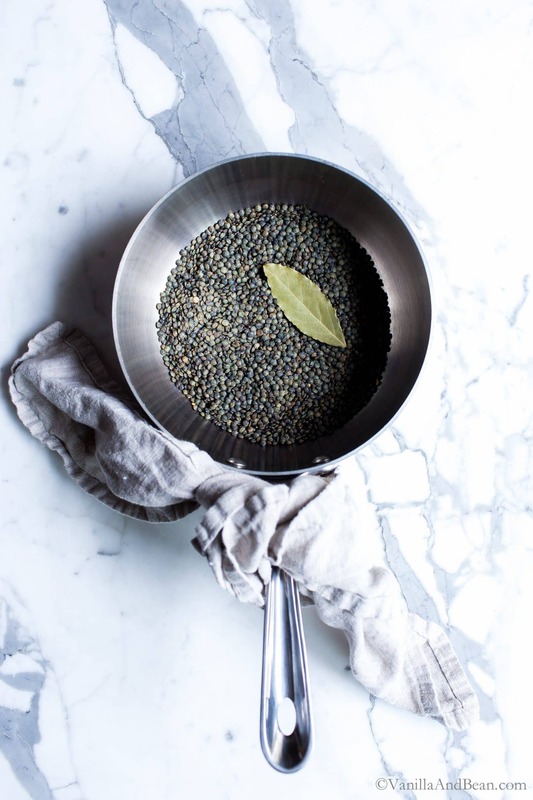 Spoon the lentil mixture into a 2 quart casserole or if using a Dutch oven, simply keep the lentil mixture in place. Gently spread the potatoes over the top of the lentil mixture (gently here because you don't want the potatoes to fall into the lentil mixture!). Spread with an offset spatula if desired (like spreading icing on a cake) and use a fork to make decorative marks if desired. Optional: If opting for browning on the potatoes (as seen in the pictures), drizzle a bit (about 2 T) of olive oil over the top of the potatoes, then follow the *directions below for broiling. Bake at 375F (190C) on a parchment lined sheet pan for 30 minutes or until the interior is bubbly (or bubbling over) and mashed potatoes have a nice golden hue. *Optional Broiling: To get a bit of browning on the potatoes (as seen in the pictures), set oven on broil just before the end of baking and move the cottage pie to the top rack broil for about 4-5 minutes or until desired. Let rest for 10 minutes and serve with a garnish of fresh thyme and chives. Store in a lidded container or cover casserole in foil and refrigerate for up to two days. Gently reheat in a 350F oven for about 15-20 minutes. Or freeze for up to two weeks. Thaw overnight in the refrigerator before reheating. **Find dried porcini (or other) mushrooms at Whole Foods, Co-Op or health food stores. They can also be purchased on Amazon. I like Mycological. Such a great vegetarian dinner. I have never tried my hand in cottage pies, but after seeing this I want to. SOOO well done. Made this a few days ago and, LOL, labor intensive doesn’t begin to describe my cooking-by-mistake method! Bite sized chopping ended up as minced -and that was by hand! So I re-chopped and am waiting to use the minced (did I mention I chopped them that small by hand?) parsnip, carrot, celery and onion for something else. However crazy-long this took me to make (others will fare better with the time), it was delish. Question: my lentils were rather crunchy. I used the 2 cups of water and even added a bit at the end of cooking them b/c they still weren’t tender. The texture added a nice pop (sort of like corn kernels in a meat-based pie) but I’m wondering if you expect them to be softer and, either way, what do you suggest to soften them a bit? Hi Tonya! So happy to hear you enjoyed the recipe… thank you for coming back and leaving a note. But woah, all that mincing by hand? At least you’re now prepped for a good soup or stew! For the lentils, they should be tender after cooking for 30 minutes. Cooking longer should remedy them not being tender. Just add more hot water. Wow! Did not expect a reply from you today as I know you’re cooking! Thank you and I will cook them longer with more water. Thank you, I’ll try that. 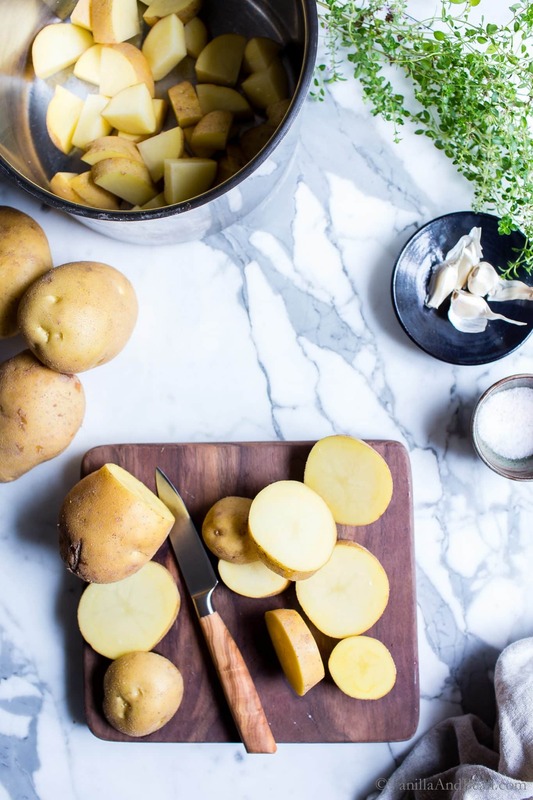 Do you have any thoughts on what to use instead of potatoes? I am allergic to them. Hi Donna! You could give mashed cauliflower or mashed sweet potatoes a go (if not allergic to sweet)! This is beautiful, Traci! I would be thrilled to see this dish on the holiday buffet! A perfect and delicious recipe to feed a crowd! Pinned! What a great vegetarian twist on the classic Shepherd’s pie Traci! Actually, Mr. Picky loves lentils if you can believe it?! And he loves mushrooms too, so this would be a hit with both of us! Looks like the ultimate in vegetarian comfort food! Hosting Thanksgiving is always a big undertaking but I think it’s my favorite meal. I always try to make as many things ahead of time as possible. This recipe sounds like hearty option for those not feasting on the turkey. Hope you enjoy putting together your Thanksgiving menu! Wow! Thank you so much! My meat loving husband had two huge servings! Yum! Yum! Day made, Teresa! Hooray for mushrooms and lentils! I find them to be an irresistible combination too. Thank you for coming back and leaving a note! So much comforting goodness rolled into one dish. I think anyone would be thrilled to see this on their Thanksgiving table! Mmm…you know I’m a mushroom freak! So this is right up my alley. Especially with those mashed potatoes on top. What a cozy, hearty main meal! This is definitely my kind of holiday meal! Love all of the savory flavors (especially dried porcini mushrooms- YUM) and that comforting mashed potato topping. This is proof that plenty of great recipes existed before the internet, lol! Thank you! I made this pie and it was AMAZING. 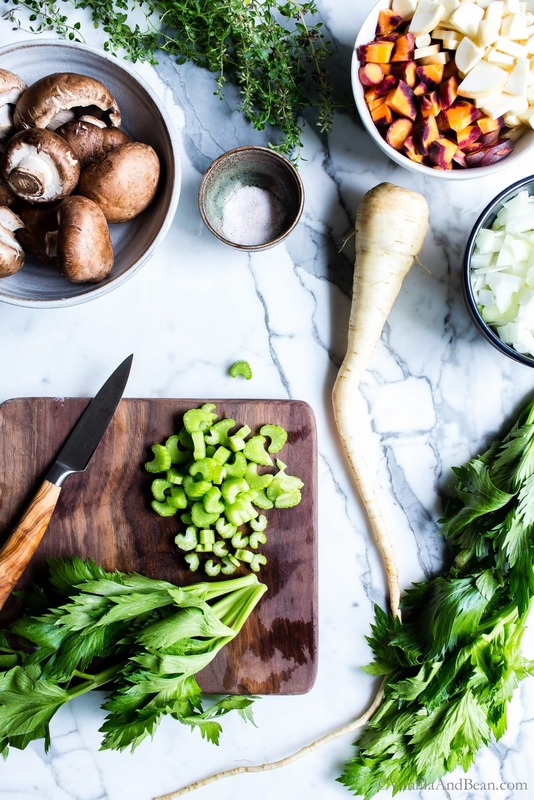 I feel so fortunate to have found your blog, with all its healthy, beautiful, fine food. We feasted! That looks really delicious! I was looking for a vegetarian version. Pinned. Yum! I rarely come across a new recipe that I decide to try on the very same day, but yours looked too good to pass up. It turned out beautifully! When I make this dish again I will likely use fewer lentils (1/2 cup) and keep everything else as is. Thank you for the delicious, hearty dinner idea! What an interesting spin on traditional Cottage Pie. We have a vegetarian night once a week – this will be on the list to try soon! Oh my, Traci! 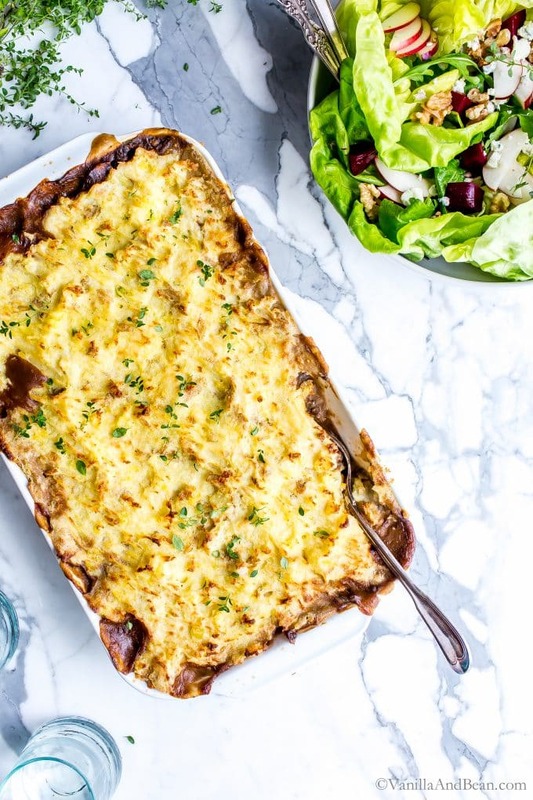 This cottage pie is gorgeous! I’ve only made the shepherd’s pie that I grew up eating which, of course, includes meat, but I am very excited to try your recipe. I love the addition of the lentils and porcini mushrooms. And I must say…I feel like I’m sitting right at your counter as you’re preparing this gorgeous meal. Love it! Beautiful post! Thank you, Annie. 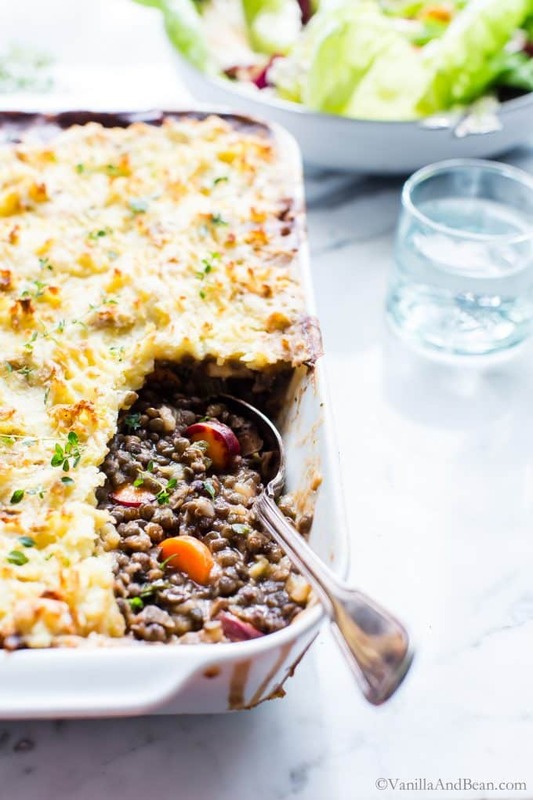 :D I grew up on shepherd’s pie with meat too and it is one of my most favorite comfort foods for fall and winter. I knew I had to find an alternative, and this is it. I have a few other variations that are delicious, but always try to use seasonal veggies. In the summer I’ll use zucchini, tomato and corn. So glad you stopped by! I always depend on “comments” for recipes I am thinking of making; however, for the cottage pie recipe all I found were comments from people who have NOT made the recipe. Maybe further on in the comment section I will find some who have actually MADE the recipe. That’s what helps me. I love this recipe and the photos! I have made a vegetarian version of Shepherd’s pie before..this is so much more rustic..the mix of mushrooms looks exotic and will certainly amp up the flavor. Not a radish lover, and never tried a parsnip thinking it will taste similar. Hi there Pragati! Thank you for your kind comments. I am not a radish lover either (the one veggie I won’t eat) but parsnips actually taste similar to carrots. They are very mild. One way I love to eat them is roasted at 425F tossed in coconut oil and rosemary leaves like french fries. Oh, they’re excellent! I hope you’ll consider trying them! That looks so fabulous I love it! Cottage Pie is in my top 5 favourites but my children don’t like mashed potato so I hardly ever make it. Madness, now I have seen your delicious pie I am going to make it for myself and my husband! Hi Anna! Thank you for your kind words. It’s tough when you’re cooking for many and there’s multiple dislikes of something. I hope you’ll be able to enjoy the cottage pie anyway… perhaps the kiddos can scoop the mash off? this looks soooo good. 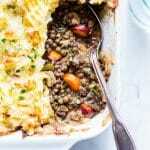 I have been looking for a good veggie shepherds pie recipe. can’t wait to put this together. Hi Maggi! Thank you for writing. I hope you enjoy the recipe! Oh my, this looks delicious! Thanks for the vegan options! You’re welcome Debbie! Thank you for stopping by :D ! No doubt, Julia and thank you! :D More comfort food please! And yes, lentils and mushrooms impart such a lovely earthy flavor. Mashed potatoes are pure comfort any way you fix em! Skins on please! I always have to scroll through your post several times just to really take in the photos. You do the best job of making me feel like I am in the kitchen with you! I love it! This dish looks lovely, so perfect for a cold winter day! Awwwh, Annie. You made my day! I am totally dealing with light issues right now. Were so dark up here during winter it makes it such a challenge to shoot… and then theres the timing! Food blogger troubles :). This is a nice recipe for a cold fall or winter day! Hope you enjoy the recipe! This looks wonderful. Beautiful photography, I love the rustic and elegant look. I made a broccoli and cheddar chicken shepherd’s pie, now I want to try this. Too bad I didn’t see this recipe before I posted my Thanksgiving recipe roundup. I’ll keep an eye out for my next roundup. Hi Matt! Thanks so much for your kind words. This is quite a rustic recipe.. but so hearty. A great fall/winter meal. Thanks for keeping me in mind for your next round up! This sounds delicious! My mom and sister don’t eat meat, so I’m always looking for vegetarian meals that everyone in the family will love. This sounds like it will be a big winner at our house! And such beautiful pictures. Thanks for sharing! Yes cottage pie!!! This looks fab. So perfect for the rainy windy yucky day we have here. I’m with Cheryl, parsnips!? Brilliant. Hi Sam! Thanks so much! Us too… windy, rainy.. but it’s supposed to clear up later this week! :D Go get those parsnips! This Cottage Pie (I never knew it also went by that name!) looks so warming and comforting! 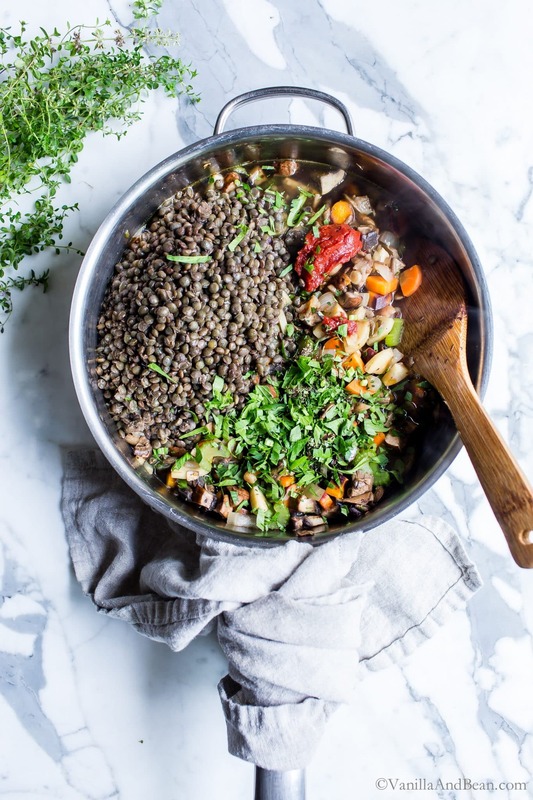 I love the addition of the lentils – I’m sure they fit in wonderfully with all the yummy mushrooms in your recipe! I made Shephard’s pie this past Saturday for dinner and it really hit the spot! 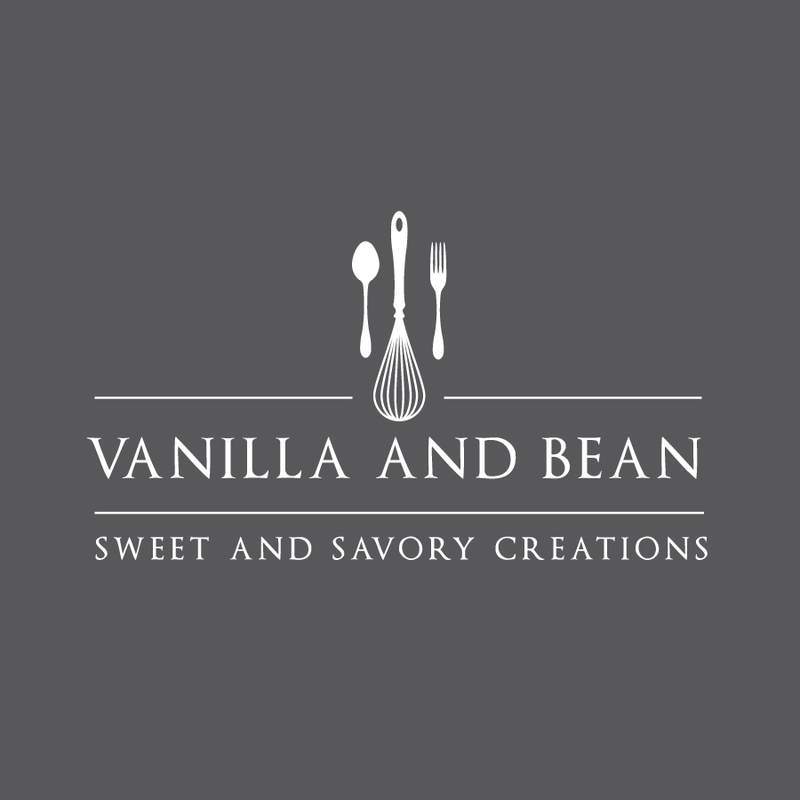 Can’t wait to try your recipe next :) Pinned! Thanks so much, Ceara! There is another name besides cottage and shephard’s… it’s farmers pie! Who knew?! Thanks for your Pin!! I’ve never heard of cottage pie but boy this looks deeeeelicious! Gorgeous pics of outside too! Fall is my favorite time of year but the leaves have sadly all fallen here in CT. Thanks so much Tina! We had a wind/rain storm a few nights back, so now, all the leaves are about gone too around here. Hope you enjoy the cottage pie!! I love this comfort veggie cottage pie Traci! I like the use of lentils and mushrooms.Will have to try it, it is getting cold here so this is the perfect dish for this time of the year! Awwwhhh, thank you Mira! I think you’ll enjoy this cozy recipe, perfect for chilly nights or holiday meals. Wow. Lentils! 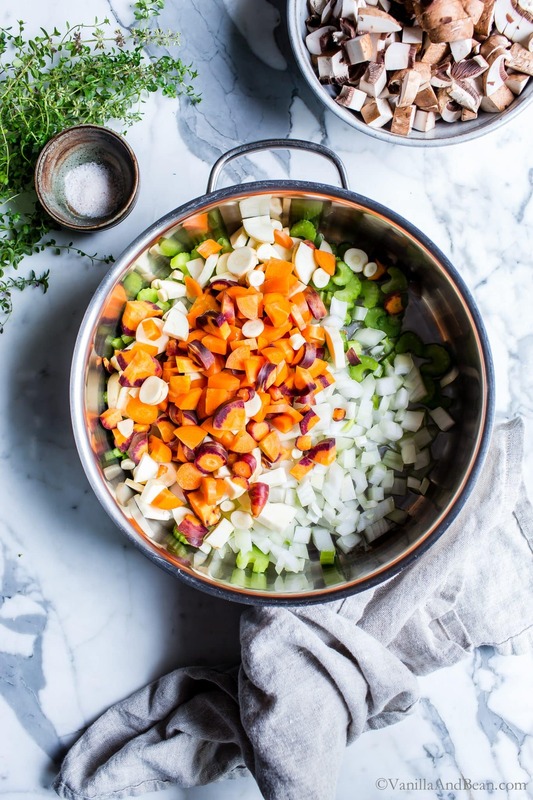 This recipe is so hearty and delicious, how fantastic. This is SO my mom and me. She’s not a huge meat fan. We love lentils and hearty winter dishes. And vegetables! I’m sending this to her right now!! wow! this dish looks delicious! I have never tried anything like it but it sounds like such a great combination of flavors and textures ;-) YUM! I love anything with French lentils! And porcini! I am so making this! The photos are gorgeous! Thanks so much Deb! :D Yeah, the porcini and French lentils have such an earthy flavor, then pile on the potatoes to increase the comfort factor! I hope you enjoy the recipe Deb! Let us know how you do! Somehow I feel that vegetarians get left out a little bit at Thanksgiving – of course we can fill our plates with side dishes (which is usually the best part) but there’s no big presentation dish like the turkey. Well, you’ve solved that problem. This would be an impressive dish to serve to vegetarians and non-veggies as well. Love lentils and mushrooms together with root vegetables. This is such a hearty, filling and special dish – perfect for Thanksgiving. Thanks, Traci! So true, Geraldine! It can be a tough time for some for sure. I remember my first vegetarian Tgiving… I didn’t know what I was going to do. I mean, we ALWAYS had turkey and sometimes ham! So, I ate sides! Not a bad thing, but no big presentation either. My occasional carnivorous husband liked this dish and he’s a pretty picky eater. The porcini give the pie a good texture that adds to the heartiness. This is the perfect recipe to feed a crowd! I love the addition of porcini mushrooms here- such a gorgeous flavor. And do you know what else is gorgeous? That ladybug shot! Really, it’s lovely. I had one in my office the other day but sadly, I squashed it with my computer :( Beautiful meal, Traci! Mmmmmm, yes. This looks so wholesome and filling but actually healthy! I make a vegan shepherd’s pie, and I’m assuming that’s.. basically the same thing as cottage pie? I really need to get on expanding my root vegetable repertoire, too – I mean, parsnips?! I never even go there. You’re my inspiration, Traci. My INSPIRATION! My mouth is watering!!! My goodness, Traci, you’re kitchen creations make my knees buckle. My senses have been awakened!! Cottage Pie!! !